This week I had the joy of leading a group in consideration of what it takes to be growing as preachers. I told them we need to wear the right strait-jacket. I also told them that most preachers wear the wrong one. Some like to impose significant amounts of structure on the preaching event, but in reality there are few limits involved. There may be some limits imposed by the culture and heritage of a church – congregational traditions – and it is wise to think carefully before smashing through those expectations in an attempt to be creative. However, these limits vary from place to place and it is possible, once trust is established, to carefully adjust such expectations. Wear This One – “To have integrity as a biblical preacher, I must be constrained by the true meaning of the passage I am preaching.” Each passage is saying something. When we preach, we need to say the something the passage is saying. We cannot say anything from anywhere in the Bible. While we can tailor and target and re-order and re-emphasize, we cannot say whatever we want from a passage. Some people, in the pursuit of “interesting” and “relevant” and especially “original,” will undermine the exegetical integrity of their preaching by saying what the text simply isn’t saying. Be constrained by the text you preach. 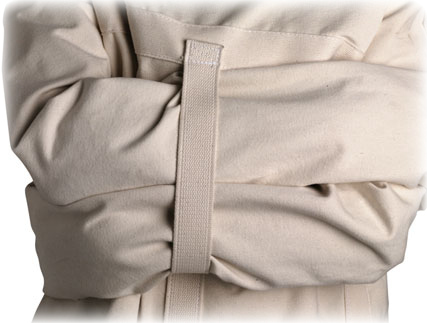 Don’t Wear This One – “To be considered a preacher, I must preach in a certain manner, using a certain form that qualifies as a real sermon.” While the first strait jacket guarantees our integrity as Bible handlers, this second jacket can sometimes undermine our effectiveness as biblical preachers. What shape should a sermon take? What style of delivery should be used? Matters of form are matters of freedom for the preacher to evaluate strategically. Different texts, different circumstances, different occasions, different strengths as a preacher, different personalities, different listeners, can all prompt different sermon shape and delivery style. At this level our goal is effectiveness in communication. We do not need unnecessary limits in place to hinder our effectiveness. Sadly too many preachers settle into a predictable pattern where actually there could be considerable freedom – in matters of form and delivery. And too many show a wild freedom where there is a limit – in the meaning of the text. Let’s be sure to wear the right strait jacket, but throw away the other! “Spot on!” I decided a few years ago that the texts meaning and structure should guide both my sermon’s content and structure. Trying to present a text from Psalms the same way I present a text from Romans is a real mistake. Thanks Mark. I tend to see the structure of the text as the default starting point for the structure of the message, but sometimes will shift from that if the listeners would be better served by an adjusted structuring or order. The vital piece, from my perspective, is that the meaning of the text be conveyed with an emphasis on its relevance to the listeners now. I so agree that preaching a Psalm as if it were a Pauline sentence is a mistake. Philip Decker reblogged this on The Hagiasmos Project and commented: This is a fantastic article, I pray that pastors would start thinking this way. You can’t read a passage and make application without considering the proper interpretation. I agree completely with the post and the understanding that preachers really ought to feel a great deal of freedom, as long as they are within the textual boundaries, and boundaries of propriety, taste, etc. Like kids in those inflatable bouncy-houses….once you’re inside the thing, let loose! That’s why I so appreciate this site: the variety of posts and great thoughts from different angles really gets the creative juices flowing. Thanks Gordan, I love the bouncy house analogy!